I start this interview by saying “I am here with the one and only Austin Pendleton.” This is not a casual or frivolous comment. Nominated for a Tony for his direction of Elizabeth Taylor in The Little Foxes, winner of a Drama desk and an Obie award, actor, director, playwright, producer, teacher and inspiration, Austin Pendelton is one of a kind; a singleton. Unique, special, extraordinary and esteemed by his peers (listen to Meryl Streep and Olympia Dukakis talk about him), Austin has somehow managed to stay under the radar of fame. His love affair with the theater began when at seven years old when he snuck down stairs to watch his town’s fledgling community theater group rehearse in his living room. But young Austin denied his interest in acting to his friends, he says “who would believe that a nerdy kid, who wore glasses and stuttered so badly could be an actor.” Apparently Austin did. Apparently Austin was right. While not able to stop him, his stutter remained an intractable stumbling block on the path to his beloved goal – working in the theater. But Austin is not only incredibly talented, he is also incredibly tenacious; listen to the determination with which he worked to overcome his stutter and so become, while not famous, a professional who is always working, always in demand. 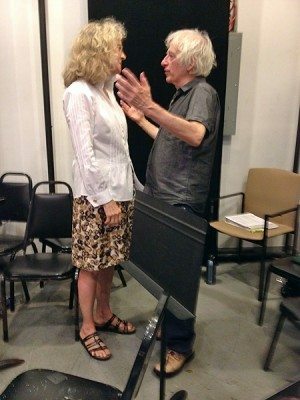 Check out Austin Pendleton Theatre Credits and Austin Pendleton – Filmography to see what I mean.